With a history of creating products that bring the finest finishes to wood surfaces, which stretches back over 150 years, BRIWAX is the number one choice for furniture makers and lovers of wood in the UK. Based on original formulas that were developed during the second half of the 19th century, the BRIWAX original range of wood polishes can be used on a wide range of wood surfaces, either those that are finished, such as French polish furniture, or unfinished raw timber surfaces. Finishes available in the range are numerous and include waxes for just about every type of wood, including those for teak, mahogany and antique mahogany, walnut, jacobean and also pines of different types. The secret formulation of BRIWAX is simple to apply and combines beeswax and carnauba to bring an instant shine to bare wood, which is also very fast drying due to the addition of solvents, that bring the additional benefit of any finished surface being easier to clean. The wax is supplied in resealable tins or also as an aerosol. 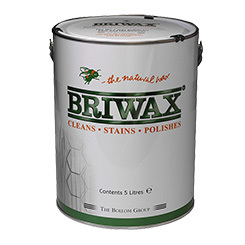 The BRIWAX range is not just limited to wood wax products as they also produce innovative products for fixing wooden chairs, used by professional restorers, and also applications to protect and shine marble and granite surfaces. All BRIWAX products come with clear and simple, easy to follow instructions to ensure the perfect finish and shine for any wood surface in your home. Have a question about our Briwax range? We‘ll be happy to help. Send us a message here.